Last week, I read a really fantastic blog post by former Team Rev3 member Heather Gannoe about an experience she had at a recent running race where she observed first-hand for the first time what a back-of-the-pack racer experiences. It’s a real eye-opener post – and depicts an environment that a whole lot of us athletes never get to experience. Heather’s post is a must-read. Take a few moments to read the comments as well, as they are really remarkable. You can find Heather’s post (HERE). Reading Heather’s post reminded me of a blog I wrote a couple of years ago after racing Rev3’s South Carolina race. I was coming off a really good performance (for me). In fact, I earned a really significant personal best at the race – and felt really stoked about how I did at the race. Honestly, I was no where near the pointy end of the race, but I wasn’t the last place finisher either. Clearly, I was a back of the mid-pack runner. I wanted to compare my race with that of the professionals who actually won the race that year. The results blew me away (honestly, so did the pros)! Ever wonder just how fast a professional triathlete is? Click (HERE) for my article and a pretty snazzy (if I say so myself) graphical representation of just how slow I was …. er…. just how fast they were! Embrace the Triathlon Prima Donnas! People take themselves way too seriously. At work. At home. On the cricket pitch. In triathlon-related social media. Those of us who play at triathlon and who are also on social media often fall into a trap of becoming too self absorbed. Too often we become braggarts. We pine for attention. We pander when we should be praising. We’re too politically correct. Too focused on our image. Often at the detriment of others. But that’s life, right? Shouldn’t we look down on others that we perceive as lower than us? Umm…no. We should all be issued a Yellow Card. Take heed all ye heathens who dwell in the land of socialness! Life is not all serious. It’s not all about your personal best in the 5k or your uber difficult hill workout. Triathlon is at lest partially about celebration of accomplishment. Sure…we can (and should perhaps) talk about our love of triathlon and the things that are fun, difficult, challenging, exhausting, flatulence inducing, or sun-burning. We should post selfies on treadmills. Personally, I’d like to post a selfie of me doing sidestroke in my next race. I want you to think that I’m better than you. That I’m a better triathlete. In fact, I’m fat, slow, and often too unmotivated. I have really poor swimming technique and don’t ride a carbon bike. I know that I’m not going to bust out a 23mph average over 40k (let alone 112 miles) or drop a 15 minute 5k in a sprint race. But I recognize that, and try to not take myself too seriously. I try to not be too snarky. It’s hard, though. Sometimes I become a Slowtwitcher and start complaining and looking down on everything. I tell my son that he’s too slow of a swimmer and that turning a 100 free in 52 seconds isn’t good enough. Right before I go and drop a 1:40. Triathlon isn’t about telling someone that they are doing it wrong. That their seat is too high or their catch & pull aren’t perfect. It’s not looking down on someone who isn’t in a team kit or doesn’t have an M-Dot tattoo. I shouldn’t think I’m any better than you because I did an Ironman race. Hell, I was almost the last finisher in my race! I wasn’t technically last. Just close to last. At least I was faster than a few people. It had to have been because I was riding on my rented Zipp wheels, therefore eliminating all potential drag from my bike when they were on a the adult version of a Big Wheel. Or maybe my superior VO2 max. Whatever that is. Triathlon is a hobby for most of us. It should be fun. People bust their asses to train for a race – they should be allowed to have fun no matter if they are on a $10,000 super bike or a $100 bike from Goodwill. Who cares? Be happy for them that they are out doing something. Besides, the dude riding the $100 Goodwill bike probably makes more money than you and me combined (and certainly doesn’t rely on a homestay at the race). And while you’re at it, take a good long look at yourself in the mirror. Chances are that compared to someone else, you are slow, fat and unmotivated. So while you may be fortunate enough to be a podium finisher (btw, congrats if you are), keep in mind that there’s always someone better than you. His name is Andrew Starykowitcz. He’s better than you, and he’ll tell you that too. And he doesn’t always drink beer, but when he does, it’s with the beautiful people. So now, I’m going to go grab a drink from my favorite nutrition sponsor, relax in some amazing apparel from another sponsor, and go read some blog posts from some age group hacks like me. Never forget, I may be slower than you, but at least I’ll look cooler! You know, as an athlete (a term I use loosely in relation to me) and sports fan, there are a wide variety of athletes that I hold in high regard. Some of these athletes are famous and are in the newspaper, on ESPN, or online literally daily. Others are athletes that fly under the radar. It seems like it might be fun for me to write occasionally about athletes that have inspired me for one reason or another. To showcase their performances. Or their character. Or their mettle. And with that introduction, I’d like to start this on-again, off-again series by introducing you to one of my Team Rev3 Tri teammates, Susan Haag. Susan may not be the speediest athlete at a triathlon, but she may well be the most experienced one. She has done a mind boggling array of events: More than 70 full iron distance races. Countless marathons and ultramarathons. She did more than 75 events in 2012 alone! I don’t know if I could even keep up with the overall number of events Susan has done in her career (and I’m not sure if she could even tell you). 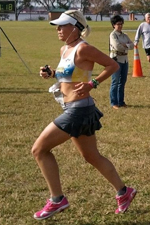 Just a week or so ago, Susan ran in a 55 mile ultra to support the Wolfson’s Children’s Hospital in Jacksonville. In two weeks, she will be racing the Florida Ultraman (which, by the way is an iron race on steroids: 6.2 mile swim, followed by 261.4 miles on her bike, then a double marathon – 52.4 miles). The sheer distances and volumes this woman races are staggering and mind boggling. I frankly don’t have any clue how she trains and races, all the while managing a career as a local assistant district attorney. Susan also volunteers considerably. She’s on a variety of boards. She is the Florida Region representative on USAT’s board of directors. In a nutshell, this woman is B-U-S-Y. But quite honestly, it’s not the prolific miles and number of races that inspires me about Susan. Rather, Susan’s approach to triathlon and endurance sports in general is what really makes this athlete stand head and shoulders above others. Not a race goes by where Susan doesn’t stop to pet dogs, great children or chat with volunteers. For Susan, a triathlon or marathon is not just about the race; it’s more about the experience. She epitomizes what endurance sports should be all about. Togetherness. Fun. Loyalty. Conviction. Inclusion. As an example, Susan shared an experience she had when she ran in the recent Ultra on behalf of Wolfson’s Children’s Hospital. This year wasn’t the first year she had participated in this event. In fact, last year, she met a young man who was frankly pretty sick at the time. This year, she came across him again – only this time he was competing as part of a relay. He was struggling to run very far or very fast. Susan connected with him and his mother – and ended up running and walking with him for an entire lap – lifting his spirits and confidence and mood the entire way. It didn’t matter that Susan had several additional laps of her own to run; she selflessly gave of herself and made a lasting impact on another athlete. It’s like Susan that I aspire to be. To be able to participate in events, have a blast doing it, and making memories with others. To me, that’s what I’d like to model each time I toe the line at a race. This past weekend, my son and I traveled to Gainesville, FL for the annual Gator Swim Club Holiday Classic swim meet. The Gator Classic is a huge meet, with more than 700 age group and senior swimmers. Typically, the meet draws competitors from not only Florida, but also Georgia, Alabama and South Carolina. To say this was a huge meet was an understatement. Contrary to lots of folks’ opinion, I actually really enjoy going to swim meets. And it’s not because I love the smell of chlorine, either! I like to go to big meets so I can watch and learn from people who are far better swimmers than I am. The learning was on full throttle this past weekend, too. I paid particular attention to a couple of distance races – the 500 free and the 1650 free (a/k/a the “swimmer’s mile”). These distances mostly approximate what we do in triathlon, so I wanted to see what these swimmers did to be so fast. Front quadrant swimming– the guys who were among the fastest in both distance races were really good front quadrant swimmers. They almost looked like they were doing catch-up drill the entire way, but had less glide in their stroke. High-tech suits – yes, swimmers love their high-tech gear almost as much as triathletes do. This weekend, there was a plethora of high tech gear in the pool. Seemed most of the suits were Speedo (there was no lack of Fastskin’s at the pool), but I did spy some Tyr suits as well. Breathing – one thing I paid a lot of attention to was how the swimmers were breathing? Every other stroke versus every five? Bilaterally versus unilaterally? There was no silver bullet here – they were doing a little of all of the above. What I find really interesting is that no matter what swim coach I talk to, what books or websites I read, much of the coaching and feedback is the same – and very similar to what I observed this past weekend. There must actually be something to it! PS – My son had a spectacular meet this past weekend. 5 PR’s out of 7 races. He took 5th in the 200 back, 9th in the 50 free and 100 free (just missing making the finals for both); the rest of his races were in the mid-teens in terms of placement. And he is thisclose to making a AAA cut for his 50 free.